The ONE Dot is designed for home security, which provides a whole day protection for your home safe. Instant 2MP high definition living stream can be seen via your phone, tablet or laptop from anywhere and at anytime. Featuring 90°wide viewing angle, 340°pan and 120°tilt rotation range, provide a 360° full security protection. Receiving push notifications when motion is detected, keep an eye on your home safety. Compatible with Alexa and IFTTT for free. For Alexa devices, such as Echo show, Echo spot and so on. For IFTTT device, e.g. the camera works with Wink. Support auto-tracking function, it could automatically track any moving objects to film the trails. Support RTSP, it could be added into Blue Iris/Vlc player and some other three-party software to watch. Support motion detection recording and customize the time recording, the phone could both receive push notification. Multiple storage methods. LaView Cloud Storage provides 2 premium plans and a free 30-day trial, and an optional max 128GB TF card storage is available. The camera also supports to connect with LaView NVR. Real time, remotely view, two-way talk. You can remotely view live video footage of your house anytime and anywhere no matter you’re using a smartphone, tablet or computer. With built-in speaker, you can communicate with family and friends. 【1080P HD Resolution & Auto-Tracking】 This 2.0 Megapixel(1920*1080p) Wireless IP Camera delivers sharp and detailed videos day & night. Apart from a 90°wide viewing angle, 340°pan and 120°tilt rotation range, it also could automatically track any moving objects to film the trails, creating a 360° surveillance coverage. 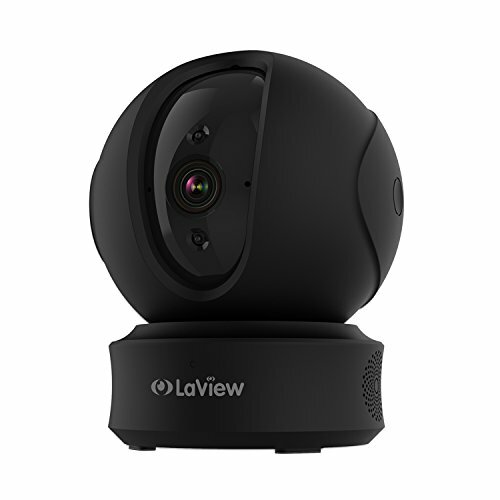 【Compatible with Alexa & IFTTT】 LaView ONE PT surveillance camera supports Alexa for voice control (Alexa device sold separately) and also can be controlled by other smart home devices through IFTTT to keep an eye on your beloved ones and property. It only works with 2.4GHz WiFi network. 【Cloud and Local Storage】 This indoor camera supports cloud service, which uses Amazon Web Services (AWS) to securely store all videos. Every video stored on the cloud is protected by multi-level security and end-to-end video encryption. Built-in micro SD slot supports up to 128GB SD card. You can also connect it to LaView NVR for more video storage. 【Two-Way Voice & Motion Alerts】 Equipped with microphone and speaker, this WiFi camera allows you to listen and talk with pets and kids in real-time. When any potential risk is detected, a notification will be pushed to your phone. Moreover, our free App makes it possible for you to view live video anytime and anywhere, creating a complete peace of mind for you. 【Reliable 24x7 Tech Support】We provide 1-Year-US Warranty and Lifetime Support. If you need any help, please call us at (650)730-2518. BrovisionTech is always standby for you!